I really don’t see covering Hollywood as all that different from covering the kremlin or the federal government. I’m always fascinated by closed societies that don’t want prying eyes. 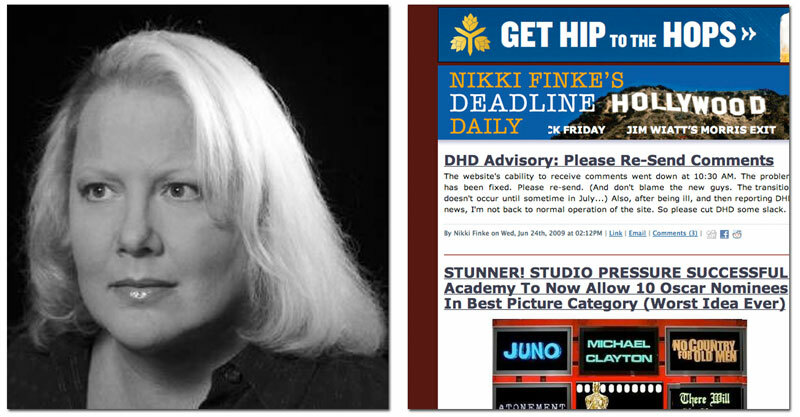 That’s a quote from Nikki Finke, who runs the Hollywood industry blog Deadline Hollywood Daily. A New York Times story about Finke ran yesterday. Among other interesting facts, it’s been revealed that Finke had a long career as a journalist, covering Moscow for the Associated Press and Washington D.C. for Newsweek. Also that she started DHD as a last resort in her career and has, at times, worked herself “to exhaustion” to keep her blog posts up-to-date. I personally think that Finke’s site is a breath of fresh air. Yeah, she sometimes seems to be waging personal vendettas, but that’s forgivable. Hers is an entertaining and unfiltered voice that takes the Hollywood elite to task in a mostly funny and engaging way. And she’s not the least bit interested in celebrity gossip. In the age of Perez Hilton, we need more bloggers like Finke.